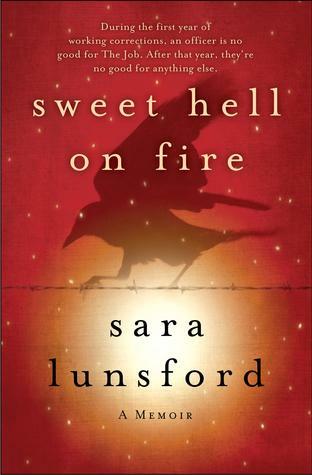 As a corrections officer at an all-male maximum security prison, Sara Lunsford worked with the worst of the worst, from serial killers to white supremacists. She knew that at the end of every day, she had to try and shed the memories of the horrors she had witnessed in order to live a happy existence. But the darkness invaded every part of her life. And dealing with a stressful divorce and a mother sucumbing to cancer led her to a complete immersion in her work and eventually the bottom of a liquor bottle. Sweet Hell on Fire takes the reader on a journey with the author, from hitting rock bottom to becoming a woman who understands the meaning of sacrifice, the joy of redemption and the quiet haven to be found in hope. This is one of the first non-fiction books I've read. It wasn't what I expected though., which in a way was good and bad. It wasn't as disturbing as I thought it was going to be (which was good) When I first picked up the book not only was excited to read it but I was nervous. I was expecting some nasty stuff to be in this book, and don't get me wrong there was definitely some but it wasn't so bad. This story tells about Sara Lunsford and her job as a Corrections Officer in an all male facility. I wasn't completely disappointed in the book and I would recommend it to others but for me I think I made my expectations too high on what the book would entail and it was just shy for me. My own fault. I have to give Sara a lot of credit because while reading this, I kept thinking there was no way I could ever do that job. I give this book 3 1/2 hearts and if she were to ever write another book, I would for sure pick it up to read. Doing the job she did and struggle with her personal life outside of work Sara sounds like an amazing woman.